Having a football party, whether it's tailgating at a stadium or celebrating in your backyard at home, isn't just about the food. Entertaining your friends with creative ways of supporting your favorite team and providing challenging interactive games makes the entire game day experience a fun one. Over the years, I've built games to play in the parking lot or backyard as well as serving caddies for food buffets and for hand held snacks. I've also built beverage holders for gallon-sized containers so party goes can serve themselves. If you can handle basic power tools and follow simple directions you can build any of these items. I've provided a description of each and a downloadable PDF with step-by-step instructions. Build one of the simpler ones and, once you get the hang of it, try building them all. They make a party a lot more fun, interactive and can be a terrific focal point for some team spirit. Also, because food is still a big part of any football party, I have a few tips and recipe ideas that tie into some of the projects described below. This project was created from three panels of medium density fiberboard (MDF). The plans show how to cut the panels and assemble them to make two beanbag toss boards. If you aren’t handy with a sewing machine, beanbags can be purchased online. This simple game uses PVC pipes and plumbing fixtures that were purchased from a local home center store. The basic box is constructed with wood panels for the sides and bottom cut and fastened together with nails. This is a versatile service station for setting up a buffet. The various levels can support different food items. One very popular thing I’ve made in the past is an oversized hamburger. I simply purchase a large round sourdough loaf from my local grocery store or bakery and slice in half like hamburger bun. I then take 2-3 pounds of ground beef and mix in breadcrumbs, an egg or two, minced onions, garlic and salt and pepper. I shape it into a large patty, about 10% larger than the size of the loaf and bake it at 350 degrees F until the internal temperature reaches 155 degrees F. I add the patty to the bun and top with standard burger toppings. 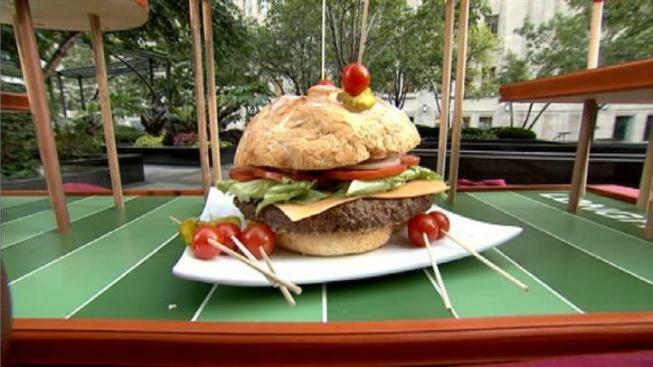 The final touch is to skewer the top 6-8 times with wooden skewers threaded with a cherry tomato and a pickle slice. Cut the burger in wedges between the skewers and you have a hefty meal for your football fans. I was in London a few years ago and a restaurant served shot glasses filled with either oysters or shrimp mixed with cocktail sauce in a long paddle with groves in it to hold the glasses. I was so impressed with that I decide to make my own. Using a forstner bit, you can easily create the necessary grooves in the wood. The handle was made by simply shaping the end with a jigsaw. This is probably the easiest little food server to make. I simply took a block of wood and drilled a number of holes so that I could insert wooden skewers into them. After grilling sausages, I cut them into 2” pieces and threaded them onto 1/4” wooden skewers that already had a hard roll on the bottom. I also put an assortment of mustards near the caddy. After inserting the skewers into my caddy, guests can simply grab one and enjoy a full snack without needing a plate of utensils. Downloadable instructions for all these projects are available at www.waynesweekend.com/downloads.